One of my all-time favorite shops is called Viva La Cottage. It's a darling little place and the owner, Angie has such a talent for setting up cozy and wonderful displays. I mean, who wouldn't want to spend a restful afternoon napping on this hanging bed? There are new items inter-mixed with antiques and flea market finds, cleverly used in the displays. Something as simple as a few mother of pearl buttons scattered across a vintage doily or as unique as an antique iron crib attached to the wall and used for shelves ~ I always go away with ideas on how to use my own pieces at home. And the linens she has are to die for! Crisply starched white pyjamas or blouses or hankies or table linens all hanging or laying out as they would in your very own home. 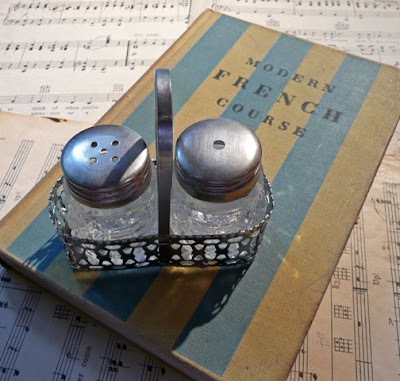 This is what I purchase on this trip ~ a lovely salt & pepper shaker set which I plan to fill with German glass glitter and a vintage French Language course book. Low tea* is served outside under this natural arbor. High tea sounds elegant and brings to mind lavish tea desserts, scones and dainty sandwiches. Often high tea is described as a more lavish version of afternoon tea. However, this has never been true, and is a misuse of the term. High tea was actually a working man's hearty tea and supper after a long, hard day of manual labor. It is actually the combination of afternoon tea and the evening meal. The working person, whether male or female, would work until late afternoon, often missing lunch and certainly afternoon tea. They would return home in the early evening and high tea would be served at the main table or "high table" rather than in the parlor or sitting room. High tea would include tea, bread and cheese. Afternoon tea on the other hand, would often be served at smaller, lower tables with dainty desserts and fine china. This was often referred to as low tea. While this does not sound elegant, it was the tea preferred by the upper class. In the 1800's the practice of inviting friends to tea became popular, especially among the rich. This will vary too depending on if it's formal or informal, but almost always includes:sandwiches and/or savories, scones, toast, crumpets or muffins, cookies, plain cakes, quick breads and sometimes an elegant cake to finish the tea. Afternoon tea is generally served between lunch and a later dinner; anywhere from 3:00 p.m. to 5:00 p.m. Loved the shop! I could be there forever just looking. I'd love to have that arbor in my yard! I think your friend/shoppe owner has it right. I love the mix of old and new... all old can look worn, musty, and a bit ragged. Everything new and it an be void of anything interesting, but marry the two and it's the best of both worlds. I love those new crisp white jammies too!